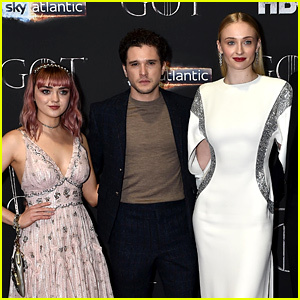 Maisie Williams, Kit Harington, and Sophie Turner attend the Game of Thrones season eight premiere in Belfast, Northern Ireland! The co-stars, ages 21, 32, and 23, respectively, teamed up for the screening held at the Waterfront Hall on Friday (April 12). They were joined by their other castmates Isaac Hempstead Wright, Richard Dormer, Kerry Ingram, Gemma Whelan, Pilou Asbæk, Joe Dempsie, Conleth Hill, Hannah Murray, Ben Crompton, John Bradley, Carice van Houten, Liam Cunningham, Jerome Flynn, Nathalie Emmanuel, and Jacob Anderson. Maisie dazzled in a pink gown, and Sophie stunned in a white and silver dress. The duo shared some adorable moments on the red carpet. Don’t miss the new season of Game of Thrones when it premieres on April 14 on HBO! FYI: Maisie is wearing Coach. Sophie is wearing Louis Vuitton. Hannah is wearing a Sachin & Babi dress, Stuart Weitzman shoes, Roxanne Assoulin jewelry, and a Judith Leiber clutch. 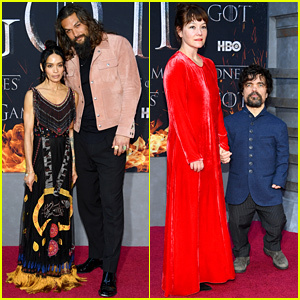 Jason Momoa and Peter Dinklage look sharp at the season eight premiere of their series Game of Thrones! The 39-year-old Frontier actor and the 49-year-old My Dinner with Herve star teamed up for the event held at Radio City Music Hall on Wednesday (April 3) in New York City. Jason brought along his wife Lisa Bonet, and Peter brought his wife Erica Schmidt. 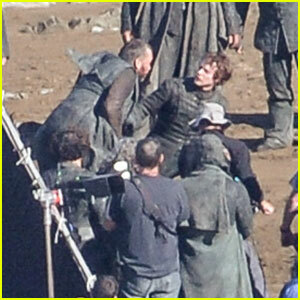 They were joined by their co-stars Nikolaj Coster-Waldau, Iain Glen, Alfie Allen, John Bradley, and Aidan Gillen. Other GOT stars in attendance included Sean Bean, Hafþor Julius Bjornsson, Pedro Pascal (with his partner Camille O’Sullivan), Charles Dance, Isaac Hempstead Wright, Jacob Anderson, Liam Cunningham, Rory McCann, Jerome Flynn, Pilou Asbæk, Kristian Nairn, Mark Addy, and writer George R. R. Martin. Friends from College actor Keegan-Michael Key, his wife Elisa Pugliese, and ring announcer Michael Buffer also stepped out to show their support. FYI: Pilou is wearing rag & bone. Liam is wearing a Brioni custom suit, a custom Anto shirt, Allen Edmonds shoes, and an Asprey watch. Kristian is wearing a bespoke Joshua Kane ensemble, Converse shoes, a Bell & Ross watch, RetroSpecs custom eye glasses, and jewelry by Julez Bryant, Stephen Einhorn, and Atonal Goldsmiths. 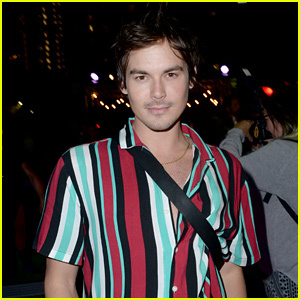 'Game of Thrones' Cast Step Out at Comic-Con & Debut New Trailer - Watch Now! Game of Thrones has arrived at 2017 Comic-Con! 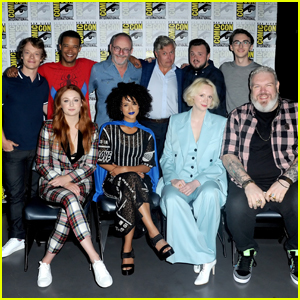 Gwendoline Christie and the cast got together for the show’s panel on Friday afternoon (July 21) in San Diego, Calif.
She was joined by her co-stars Sophie Turner, Alfie Allen, Jacob Anderson, Liam Cunningham, Conleth Hill, John Bradley, Isaac Hempstead Wright, Nathalie Emmanuel and Kristian Nairn. During the panel, the cast revealed a brand new trailer which showed some new footage, including Emilia Clarke finally returning home to Westeros and meeting up with Melisandre. While at Comic-Con, Alfie stopped by the Pepsi Fantasy Food Truck at Fandom Fest. 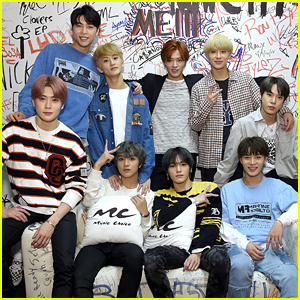 See some photos in the gallery. 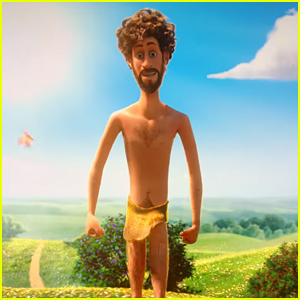 FYI: Liam is wearing a Levi’s shirt. FYI: Rose is wearing an Erdem dress with a Beladora ring and earrings. Kit is wearing Dolce&Gabbana with a Tiffany & Co. watch. Hannah is wearing a J. Mendel dress. Liam is wearing a Brioni suit, an Anto shirt, Grenson shoes, and an IWC watch. SPOILERS – these set photos may contain photos from season seven of Game of Thrones! Alfie Allen and Pilou Asbaek swing at each other while filming a gruesome fight scene for Game of Thrones on Saturday (October 29) in Zumaia, Spain. The day before, Peter Dinklage, Emilia Clarke, Conleth Hill, Nathalie Emmanuel, Iain Glen, and Jacob Anderson were spotted filming their own scenes on a beach and at a castle on a cliff. Season 7 is set to premiere on HBO in summer 2017. 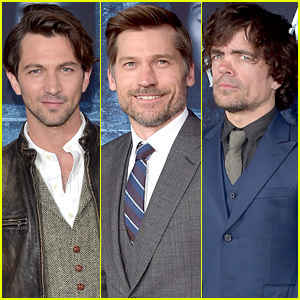 'Game of Thrones' Guys Michiel Huisman, Nikolaj Coster-Waldau & More Premiere Season 6! Game of Thrones hotties Michiel Huisman and Nikolaj Coster-Waldau premiere season six of the hit HBO series at the TCL Chinese Theatre on Sunday (April 10) in Hollywood. Also pictured at the event were co-stars Peter Dinklage with wife Erica Schmidt, Finn Jones, Gethin Anthon, John Bradley, Liam Cunningham, Joe Naufahu, Jacob Anderson, Tom Wlaschiha, Daniel Portman, Kristian Nairn, Iwan Rheon, Alfie Allen, Michael McElhatton, Dean S. Jagger, and Owen Teale. Game of Thrones season six premiere on April 24. FYI: Nikolaj is wearing a dunhill suit and shirt.